There was an article in my favorite health magazine called ‘Nature and Health’. The article started off with a question “Is your water an elixir or a dangerous drink” and I believe that to be an important question. I sadly have to say there is a number of friends and acquaintances around me that have the dreaded disease cancer. My first question as anyone who knows me is are you drinking enough water. 9 times out of 10 they will say “probably not” or yes I drink at least 4 or 5 glasses a day. Sorry not enough. If your body is not flushing your toxins from your body then your body holds on to them. That is not good when you have such a destructive disease running around your body. Aluminum, sulfate, ammonia, chlorine, hydrofluorosilicic acid, polyacrylamide, rust, slime, algae, asbestos, detergents, petrol, pesticides, pharmaceutical medications, faecal matter, herbicides, arsenic, cadmium, chromium, chloroform, copper, mercury, nitrates, cryptosporidium, Guardia, viruses, bacteria, blue-green algae. Yep most and more chemicals will be found in your tap water. No Kidding. So many chemicals I can’t even pronounce their name. In fact Western Australia Water Corporation recommends that babies under three months do not consume their water due to high nitrate content. The ABC confirmed that PFAs (polufluoroalkyl chemicals) have not been banned in Australia. This is used to create non stick cookware and fire fighting foam. This chemical has been found in over 70 sites in Australia and as far as they know. Over 6 million Americans are drinking water that contains PFAs above the EPA after level. This chemical is linked to immune system suppression, cancer, brain damage, nervous system damage, fertility problems and hormone disruption. Look I could go on and on but you need to read this article for yourself it is very enlightening and I think you really need to think twice about what you are drinking. Every minute a million bottles of water are bought world-wide. Some of the contaminates in bottled water is phthalates, mould, microbes, benzene, trihalomethane and arsenic . Brita water filters are ok especially if you are unable to carry your own water on flights. Its better than nothing but does not remove the chemicals completely. 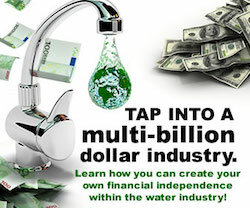 This is where I am putting a word in about the Kangen Water it really is the best you can buy. 40-year-old company and a product that is unsurpassable. It is medically registered water restructuring system and as they say Gold Standard pure water. 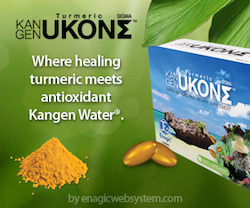 Kangen filters remove all the impurities and then alkalize the water plus give it negative charge so it can pass through our positively – charged cellular aquaporin and make the water molecules minuscule for ultimate absorption. Great for hydration and optimizing nutrient assimilation and eliminating toxins. 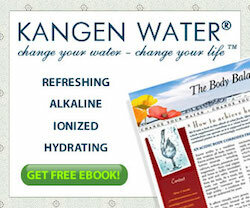 Cancers cannot survive in an alkaline environment and Kangen water is considered an anti cancer aid. Wether or not you consider this machine it is up to you but I have made you aware of what you are drinking in your tap and bottled water and urge you for your health and the health of your family and the environment to consider this machine. I own two, one in the States and one in Australia and they are worth every cent.